Hello, I hope Spring is finally starting to arrive where you are. 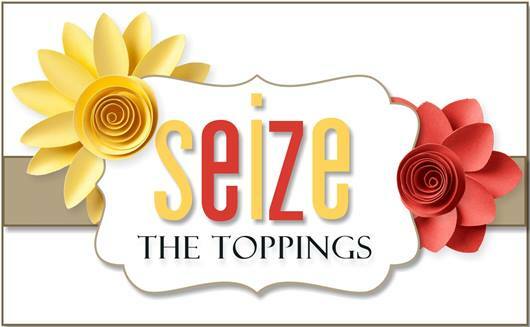 Spring happens to be our topping that Tae Eun has chosen this time at Seize the Birthday! Fits her to a tee since she’s all about florals. Today’s card is designed with a bit of this and that. The flowers are MFT, the background paper is SU and it has been sponged with Oxide Inks, the sentiment is Verve, and last but not least this great cover plate… is anybody’s guess, as it’s not mine. I really love it! I think it’s MFT but I would be guessing. I sponged the flowers as well to match the background. Categories: Cards | Tags: Card making, Cards, my favorite things, oxide inks, rubber stamps, stamping, Stamping Up, Verve Stamps | Permalink. Beautiful card with all those Spring colors. Great dies used too. Beautiful card. Love the soft, springy colors. The cover plate is from Papertrey Ink. Have a great weekend. Totally love it, Nancy! 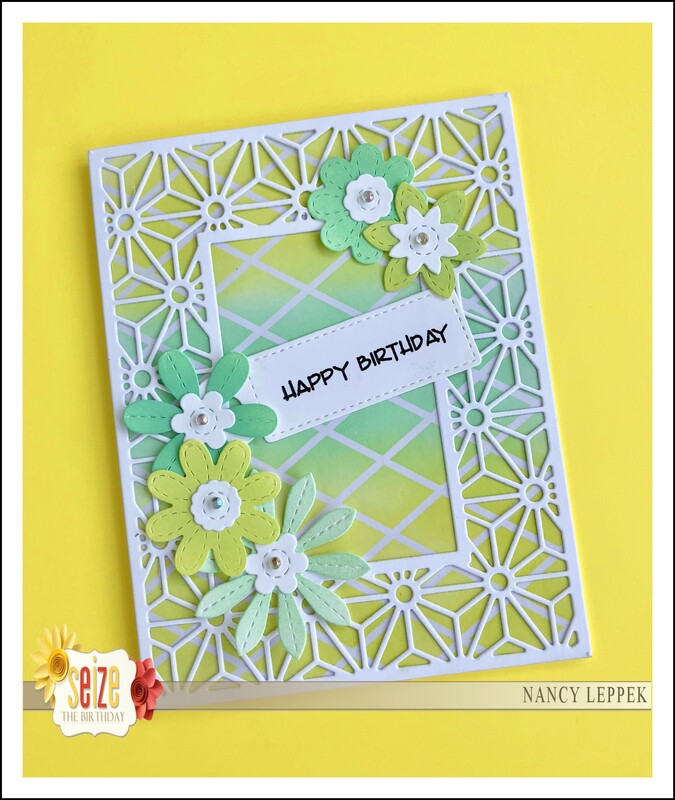 Beautiful colors and the die cut is perfect to form a frame and also to give a base to the flowers! And the flowers themselves, of course – all time beauties!! I just love this!!! Funny you should use those flower dies, I was just thinking about them the other day. I really like the look you have achieved with the cover plate die and the beautiful Oxide sponged background. Those colors are so springy and nice, I especially love that light mint color. So soft and pretty. That cover plate is so fantastic and I had to look close to see if this was done on vellum. It looks like it was not, but that is another idea for you. Or maybe acetate? This definitely looks Spring-y to me, Nancy, all flowery and soft colors. We’re not seeing much of that here. In fact we had snow on the ground this morning. I love the crisp and fresh colors you used, Nancy! Beautiful combination of various dies! I agree, It was one of the easy Toppings for me :)! I love everything about this! The white lattice on that beautiful background is terrific. Fabulous flowers too! Thank you so much for you comment on my blog!!! Your card is beautiful! I love those color together and that cover plate is so pretty! Thank you so much for your comment on my blog!!! Your card is beautiful! I love those colors together and that cover plate is so pretty!